This book is a must read for everybody who has had electricity available during the last couple of years. 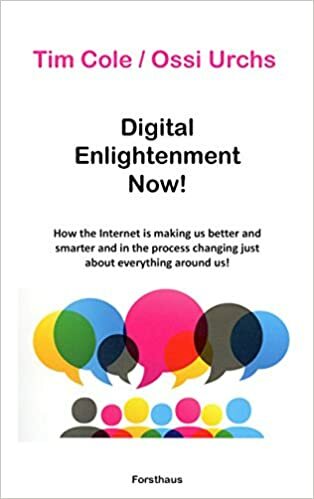 The authors, Tim Cole and Ossi Urchs, take us on a philosophical, historical and sociological journey on innovation and the thing called Internet, shedding light on diverse aspects that are usually not discussed in a technology context. In our society we usually witness a lot of technophobia and neophobia—eschewing the new and novel. The book gives us the tools to fence off the doomsayers. The authors have analyzed the historic context (ancient Greek philosophers, Indian culture, etc. ), looked into changes for society and commerce, discussed digitalisation leading to acceleration, pointed out how networking leads to change and predicted an end to the mass media market as we know it today. The power of networking is explained using Metcalf’s Law and swarm intelligence. The Digital Native is being redefined and the behaviour of the young generation in light of the new technologies is defended—attention disorder (ADHD) might be a gift and not an illness. Acceleration in network adoption (25% in 2000—85% now) went hand in hand with technical progress: In 20 years our internet speed went from 56 kb/s to 56 Mb/s. National identity will lose importance, the young generation is pushing for a new understanding of democracy. This trend will affect business: a company that blocks Facebook is becoming “unworkforcable.” Turning into digital Bedouins we will let the border between work hours and off-time blur. Work 2.0 will make the 9—5 job disappear. Having been a spokesperson for the international Liberty Alliance Project (2001—09; defining Network Identity, Federated Identity, Privacy Trust) I was very interested in the further chapters discussing the diverse aspects of privacy, anonymity and pseudonymity—again in a historical, ethical, societal and business context. These chapters alone are worth getting your hands on the book. I enjoyed reading this book very much and I will come back to single chapters for re-reading. The authors have to be congratulated for writing such a rich encyclopaedia on the technology that drives our time and affects all aspects of our lives. Highly recommended—a must read. Bet you will enjoy this book as much as I did. Tim Cole is an expert on Internet, eBusiness, Digital Identity, Social Web and IT Security. Born 1950 in Washington, he has lived in Germany and Austria for over 40 years, pursuing a career as a journalist, book author, TV moderator and public speaker on technology trends and their impact on business processes and markets. Ossi Urchs (1954 †2014), public speaker, moderator and TV expert, was the original German „Internet Guru“, not only because of his signature red dreadlocks. His formed a successful media production company, FFT, and joined Tim Cole as moderator of the TV show “E-Talk” on n-tv, the German cnn affiliate.